My new fave blog is www.myfavoriteandmybest.blogspot.com. 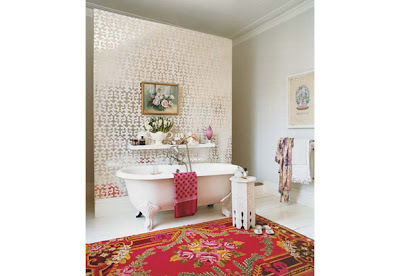 I have been on a rug search having discovered the perils of white painted floors and 4 kids. I had to do it though, so there are no regrets, but I NEED some rugs. If I found one like the one above I would buy it in a second. I love the wallpaper too. LOVE IT! 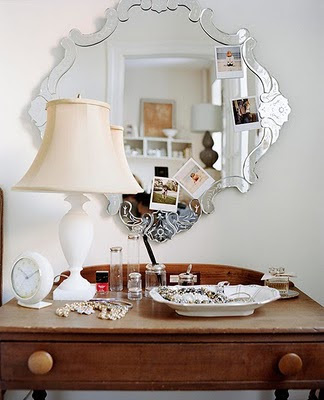 I actually own this mirror which my husband purchased for me from Anthropologie a few years ago. Like everything else I own, it is somewhere on a boat in the Pacific slowly making its way to my empty home in Sydney. I knew I loved my things, but had no idea how disorienting it would be to me without them for months! Roll on March 26 when it all arrives into Sydney.